Throughout this series we have seen a number of improvements provided by Oracle. This module discusses the benefits to Database Administrators (DBAs). From loading data to dropping columns from tables, Oracle not only saves the DBA a lot of time and effort, but also includes new features that make the database more flexible. In the next lesson we will look at the improved SQL*Loader utility. Load data across a network. This means that you can run the SQL*Loader client on a different system from the one that is running the SQL*Loader server. Load data from multiple datafiles during the same load session. Selectively load data (you can load records based on the records' values). Use the operating system's file system to access the datafiles. Use secondary datafiles for loading LOBs and collections. 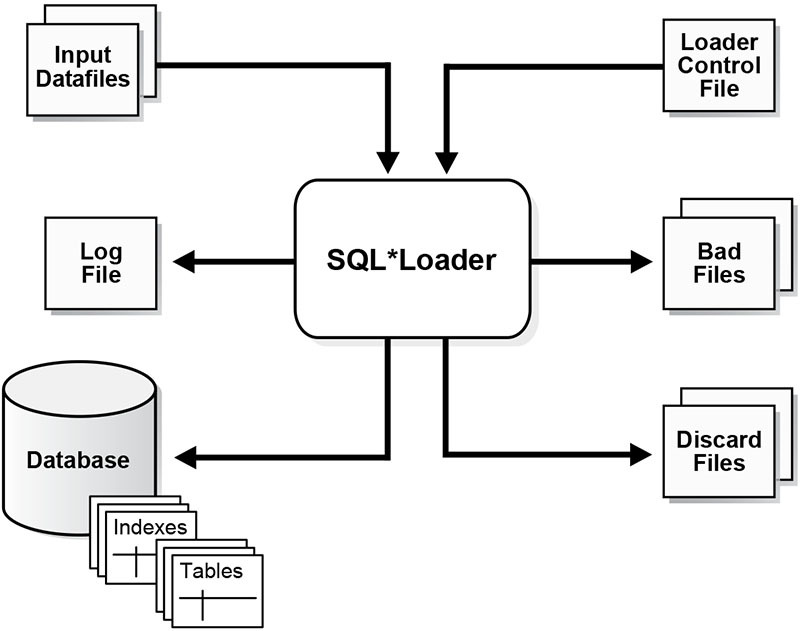 A typical SQL*Loader session takes as input a control file, which controls the behavior of SQL*Loader, and one or more datafiles. The output of SQL*Loader is an Oracle database (where the data is loaded), a log file, a bad file, and potentially, a discard file. An example of the flow of a SQL*Loader session is shown in Figure 5-1.